Today’s historic preservation post is inspired by airport architecture. I am writing this while I watch the sun set over Phoenix from the Sky Harbor airport. The design of the D terminal offers windows that let you look out over the mountain range and there is even a set of binoculars so you can get a better view. Most of the the flights to Pittsburgh arrive at the Pittsburgh International Airport, but on the other side of town, there is a smaller airport that is still in service but mostly for private planes – The Allegehny County Airport. The Allegheny County Airport is located in West Mifflin, pretty close to Century Three Chevrolet (Lebanon Church Road Pittsburgh… minutes from the mall). The Pittsburgh airport will likely be known as a prime example of 80’s architecture (which in someways is an architectural style that sums up Pittsburgh, practical, sensible, not too fancy). The Allegheny County Airport is an art deco gem. 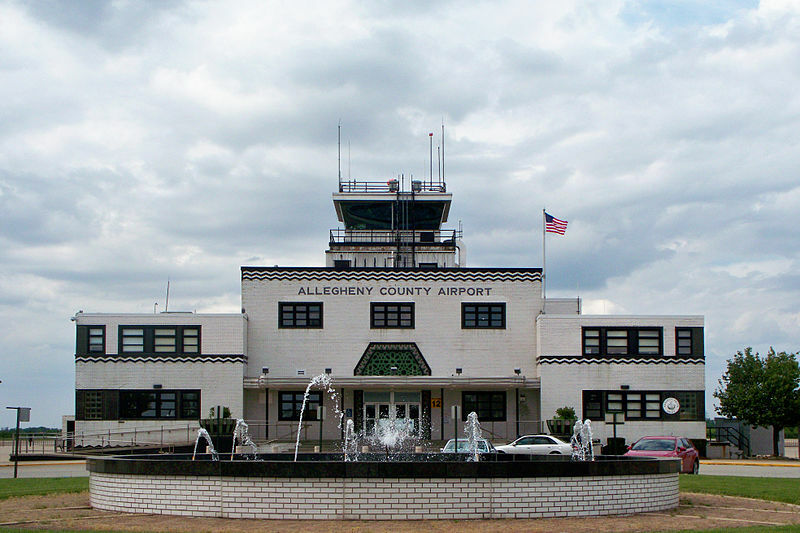 The Allegheny County Airport was built on an old slag heap, the building opened in 1931. 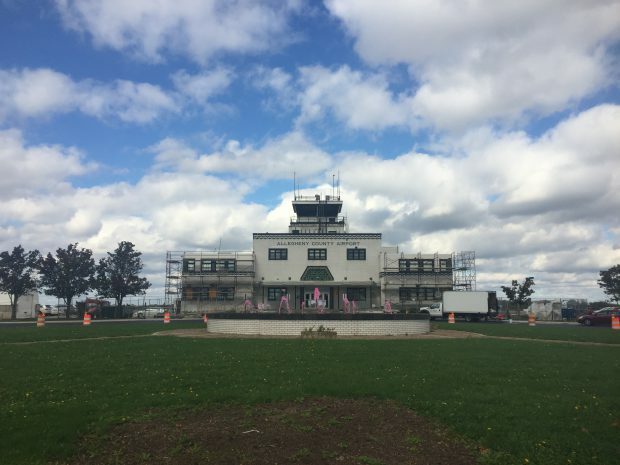 The airport building was expanded with an addition by architect Henry Hornbostel in 1936 and served as the primary airport for the city until 1952 when the Greater Pittsburgh Airport opened. The interior still has an art deco design as well. Visit the blog of author Robert Matzen to see several photos of the inside of the terminal. Allegheny County Airport, October 2016. Fountain was died pink for breast cancer awareness month. While the airport is now only used for smaller, private aircraft, last week a Southwest flight was forced to land at the Allegheny County Airport and passengers were then taken by bus to the Pittsburgh airport.